Alice Munro today was named the first-ever Canadian winner of the Nobel Prize for Literature, so we’ll pause to engage in a little celebrating here. Her name has come up every fall in recent years (and the bookies had her as second favorite this year) but the announcement is still a bit of a surprise. The Nobel jury has tended to favor writers who have a “political” side to their fiction — “political” is one adjective that would not apply to Alice’s work. What she is is a decent, generous human being with an exceptional talent for both observation and the ability to capture the results of that observation in words. Every one of her stories is like a carefully sculpted, three dimensional word picture. When considered as a body of work, they capture an entire community — there is a reason why southwestern Ontario is known as Munro country. She is 82 now and has announced that Dear Life, the collection released late last year, would be her last. If you are looking for it on a Giller list, incidentally, you won’t find it — it is a sign of Munro’s humility that after winning the Prize twice she asked her publishers to stop submitting her books for consideration. I have read all of Alice’s collections, but most of that reading took place before I started blogging here. You will find reviews of three here: The View From Castle Rock, the autobiographical collection which traces her own family history starting in Scotland; Too Much Happiness, her 2009 collection; and the previously mentioned Dear Life. And I have another review schedule to close out 2013 — I will be re-reading her first collection, Dance of the Happy Shades, as the concluding book in my 2013 project of revisiting 12 Canadian authors who influenced me. I first read it when it was published in 1968 and I was 20 years old. Today’s Nobel announcement underlined that I have been reading, enjoying and appreciating Alice Munro’s work for most of my adult life — I have every intention of revisiting some of her other early collections as well. Alice Munro is a deserving winner — and I am sure that many Canadian readers are as proud as I am that her work has received the international recognition that the Nobel Prize represents. 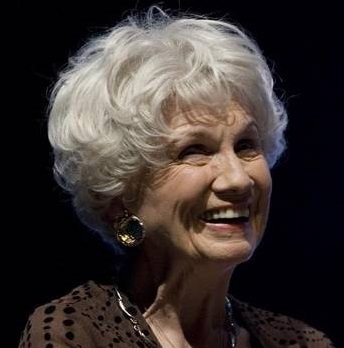 When Alice Munro’s previous original collection appeared (The View From Castle Rock, reviewed here), there was speculation that the book would be the last new work from Canada’s literary icon, now in her late 70s — even the dust cover of this new volume acknowledges she was “flirting with the idea of retirement”. She has abandoned that idea, at least for one more book, and readers are better off for it. For other Canadian authors, the news that Munro would have a new book out this fall was anything but good — she would move to the front of the queue for all of Canada’s 2009 literary awards. Munro, ever the decent person, has taken care of that last concern however, at least as far as the Giller Prize is concerned. A two-time Giller winner, she qualified for submission automatically but she has asked that her novel not be considered “to make room for younger authors” (that quote from a story written by Douglas Gibson, her publisher of 30 years and himself an icon in Canadian fiction history). Whatever you might think of her writing, this is a writer who exemplifies class from top to bottom. A collection of short stories, not a novel. This in itself is a disappointment. It seems to diminish the book’s authority, making the author seem like somebody who is just hanging on to the gates of Literature, rather than safely settled inside. You don’t have to be an avid participant in book forums or a reader of reviews to know that many readers wish that Alice Munro wrote more novels, because they get more attention and win more prizes, although Munro did win this year’s Man Booker International Prize. This paragraph would seem to indicate that she is fully aware of what she does well and is fully comfortable with it. Me too. 1. Each of these stories carries the complexity that would make it not just a good novella, but a novel. One of the things that Alice Munro is best at is compressing the elements of a good novel into 30 pages of tightly-written prose. 2. A dark side looms in every story — in fact, much of what Munro is about is peeling back the layers of the onion to expose the dark centre that is her central premise. 3. The best stories also feature another common Munro characteristic, one that she shares with authors like Ian MacEwan at his best. While 80 per cent of the story is told in scrupulous realistic fashion, there is the other 20 per cent — other-worldly, absurd, surrealistic. It is almost as if the author says “trust me and accept these unbelievable oddities — I’ll deliver before the story is done.” She almost always does. My mother had a bachelor cousin who used to visit us on the farm once a summer. He brought along his mother, Aunt Nell Botts. His name was Ernie Botts. He was a tall, florid man with a good-natured expression, a big square face, and fair curly hair springing straight up from his forehead. His hands, his fingernails, were as clean as soap, and his hips were a little plump. My name for him — when he was not around — was Earnest Bottom. I had a mean tongue. But I believe I meant no harm. Hardly any harm. After Aunt Nell Botts died he did not come anymore but sent a Christmas card. Just to give Mrs. Winner some practice, as Nina said, we left the house one evening and took a bus to the city library. From the bus window we watched the long black car having to slow and dawdle at every bus stop, then speed up and stay with us. We had to walk a block to the library, and Mrs. Winner passed us and parked beyond the front entrance, and watched us — we believed — in her rear-view mirror. I wanted to see if I could check out a copy of The Scarlet Letter which was required for one of my courses. I could not afford to buy one, and the copies from the college library were all out. Also I had an idea of getting a book out for Nina — the sort of book that showed simplified charts of history. Nina had bought the textbooks for the courses she was auditing. She had bought textbooks and pens — the best fountain pens of that time — in matching colours. Red for Middle-American Pre-Colombian Civilizations, blue for the Romantic Poets, green for Victorian and Georgian English Novelists, yellow for Fairy Tales from Lang to Anderson. She went to every lecture, sitting in the back row because she thought that was the proper place for her. She spoke as if she enjoyed walking through the Arts building with the throng of other students, finding her seat, opening her textbook at the page specified, taking out her pen. But her notebooks remained empty. — “Fiction” — a hippie-like living arrangement in British Columbia produces a marriage breakdown and evokes a flood of memories many years later when a short story collection appears. — “Free Radicals” — the death of a husband provokes reminiscent thoughts, which are interrupted by a home invasion, that ends up heightening the memories (I warned you about Munro and the surreal). — “Some Women” — in some ways, a Munro speciality, as an aging woman remembers a summer of her childhood and her first job, “sitting” a dying cancer patient who himself is the centre of a tug-of-war between his wife, his mother and a masseuse. Munro at her traditional best, this one. — “Face” –what if you were born with a hideous birthmark on half your face — and the person who liked you best wanted to imitate it? I discovered Sophia Kovalevsky while searching for something else in the Britannica one day. The combination of novelist and mathematician immediately caught my interest, and I began to read everything about her I could find. Let’s set aside the charming notion that anyone, let alone Alice Munro, still seriously consults Britannica. One of the best things about her is that she continually reminds us of our past and it is little, offhand references like this (in the Acknowledgements, of all places) that explode those time grenades. If Fyodor Dostoevsky was a feminist, this is a story he would have written (he is in the story). Sophia is a mathematician/novelist who has managed to get out of Russia to pursue her studies through a “White Marriage”. In true Russian fashion, the story moves back and forth through various time frames, always focused on Sophia’s struggle to realize her talents and find a life — those two objectives are obviously in conflict. It is not a typical Munro story but she does bring her typical talents to the table. We have a couple of husbands, conflict with authorities, conflict with her inner self. If in fact this is the last story that she will publish (I highly doubt that), it indicates that right until the end Alice Munro was pushing the envelope, and with considerable success. If you don’t know Munro, don’t start with this story — if you know her and like her as I do, it is a most interesting achievement. And as much as you might like those New Yorker versions of her stories, please buy this book. Alice Munro is not perfect, but she is as close to it as any author writing today.